Westeros is filled with warriors of all sorts. Among them is the Knight of Flowers, Loras Tyrell. So named for his personal coat of arms and his beauty, this is one warrior whose name belies his impressive prowess, both in tourneys and in combat. 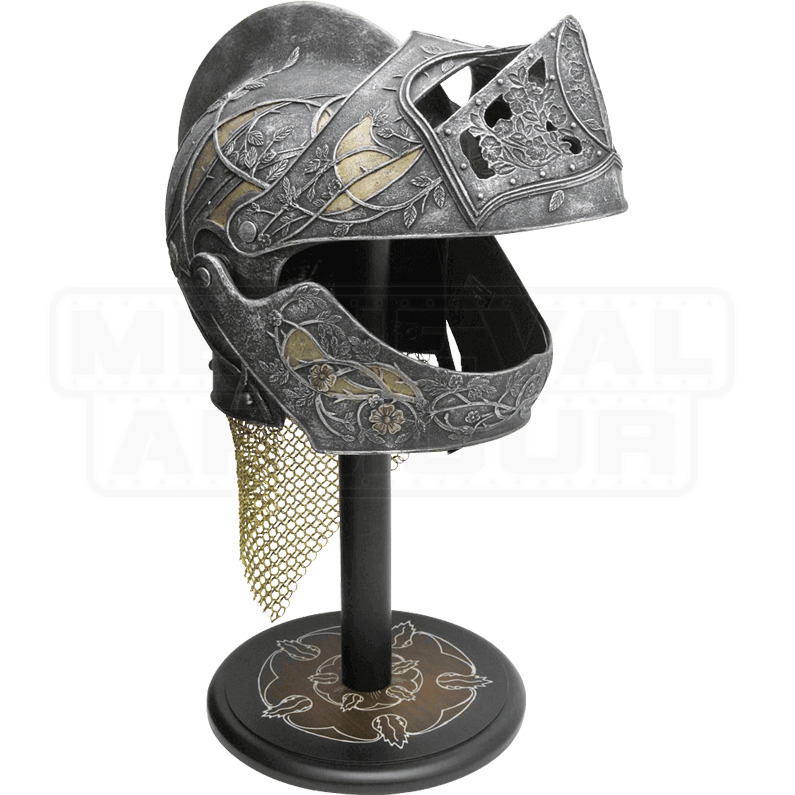 Befitting a warrior of that title, The Helmet of Loras Tyrell is an impressive thing, styled after the traditional visored helmet of the medieval knight, only infinitely more intricate and detailed. Vines, leaves, and floral patterns adorn its surface, while hints of burnished silver and gold gleam against the darker steel tones. The helmet is made from fiberglass and features an operable visor, allowing it to be lifted and lowered, depending on the wearers need. The back of the helmet is accented with a curtain of gleaming gold-colored mail links. Included with the helmet is a silkscreened wood stand, emblazoned with the sigil of House Tyrell, as well as certificate of authenticity. The Helmet of Loras Tyrell is a limited edition collectible piece. Each one is stamped with its serial number and is an edition strictly limited to 1,000 pieces world-wide.